Line an extra-large baking sheet with waxed paper or parchment paper; set aside. In an extra-large bowl gently combine cereal, pretzel sticks and mixed nuts. Pour warm candy coating over cereal mixture; toss gently to coat. Immediately spread mixture onto the prepared baking sheet. 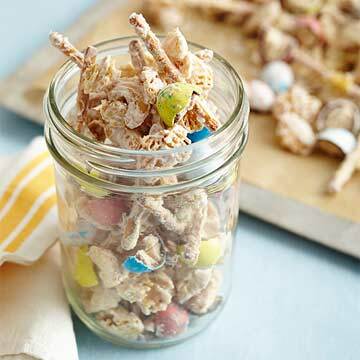 Sprinkle with malted milk eggs and malted milk powder. Cool until set (about 30 minutes) Break into pieces as needed. Store in an airtight container for up to 3 days.